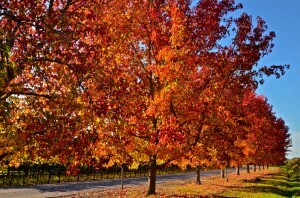 My last visit to Napa County, California – home to some of the world’s most acclaimed wines – was mid-November, having set out from home in hopes of capturing one or more keeper fall foliage photographs to include in the custom 2012 wall calendar I was working on. Despite having driven around for hours, I failed to find any vineyard color that spun my eyeballs. A dab of color here, a dab there, but nothing worth braking for. Sunlight beginning to fade, I grew increasingly impatient and fretful. 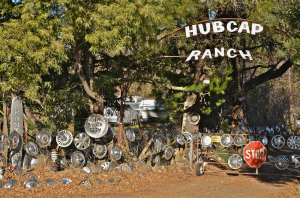 I got as far north as Saint Helena and, having come up empty, I turned around and headed back home, taking the same Highway 29 I had earlier in the day. Just past a roadside sign reading “Rutherford, Population 164,” I espied off to the side a queue of beautifully sun-spackled trees lining the driveway to a gated private residence. Whoa, now I did brake, then pulled to the shoulder, away from zooming traffic, popped the trunk and grabbed my camera bag. After squeezing off a dozen or more shots and then viewing them in playback mode on the camera monitor, I was reasonably satisfied with the results. Even had I not been, that would have marked The End, as by now the sun had disappeared behind the hills and the row of trees was mostly in shadows. Once back home and viewing my day’s harvest on the 27-inch computer monitor, I was more than simply satisfied. Here is the exposure I selected for the calendar, representing a day’s work, some 200 miles on the odo and $50 in gasoline. Was it worth it? You tell me – if so inclined, leave a comment at the end of this post. Back on Hwy. 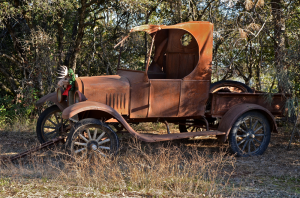 29 and headed south toward Napa, off to the other side of the road was parked a magnificently restored circa-1930 Ford stake-bed truck, parked at the entrance to Nickel & Nickel Winery. Aware that anything short of infrared equipment would have produced images worthy only of the delete button on the back of the camera, I slowed, then picked up the flow of traffic, now thickened on the two-lane, heavily used arterial into wine country. Maybe, I thought to myself, the truck will be there next time I am in the vicinity. “Next time” wasn’t until after the holidays, during which we were visited by my daughter Jessica, Cortney and their then eleven-month-old daughter – grandchild No. 1! – named Kennedy. Here she is, scrambling across the-room floor as we adults busily unwrapped Christmas gifts.. While they were here, my son Andrew, who lives a half-hour away in San Francisco, also visited. We decided that one afternoon we would drive to lesser-known wine country in the opposite direction – south – in Livermore Valley. There was time enough to visit only two tasting rooms, at Concannon and Page Mill wineries. Of the numerous snapshots taken, here is one of yours truly posed with a “marquee” 1950 Chevrolet pickup invitingly parked at the entrance to the Page Mill tasting room building. 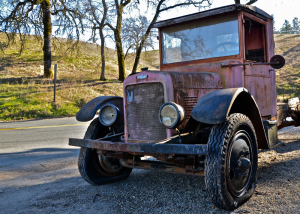 Returned as I did in mid-January to “real” wine country, meaning Napa County, my first stop was Nickel & Nickel, where, sure enough, the old Ford truck stood, waiting to greet me. It was late morning and the sunlight was perfect, bathing the front of the vehicle. Perfect! 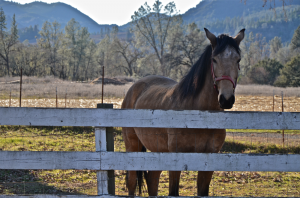 As a couple of blanketed horses indifferently nibbled on strewn hay inside a fenced paddock off to the side, I did a walk-around, shooting my subject – painted a fetching canary yellow – from a variety of angles, again employing the wide-angle lens. Luckily, because at the time there was no traffic into or out of the driveway, I was able to shoot with veritable abandon, uninterrupted. Back in the car, I looked at what I had. “Not bad,” I thought, as if to assure myself that even if there were nothing for me to shoot that day, the time and petrol consumed was worthwhile. I sauntered farther north, a whole four miles as the proverbial crow flies, to Saint Helena, which with a population of 6,000 ranks as the largest (or least small) burgh in the immediate vicinity. Weaving deftly through the thickening traffic, I made a beeline to, based on a couple of prior visits, what I deemed the best sanctum in which to quaff thumbs-up java, the Napa Valley Coffee Roasting Company, one block off the main drag. I ordered “the usual,” which for me is a low-fat (a.k.a. 2%) dry cappuccino — $3.50, thank you very much, sir. Oh, yes, plus tip. Four bucks for a drink that may (or may not, depending on what you read) pare a few minutes off my life, a tradeoff I have no trouble in accepting. In snaking the tortuous, ten-mile, two-lane road into the valley, I thought to myself, “Wow, what beautiful countryside. Were it more accessible, there probably would be high-rise condos everywhere.” But there weren’t. Not even many houses … or horses. 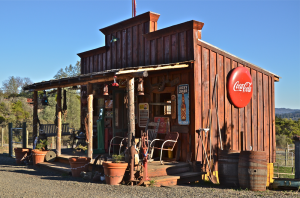 Coming around a hairpin turn, I could see in the distance, beyond an approaching UPS delivery van, an old, old truck, parked outside what appeared to be a filling station off to the left, facing a fork in the road. 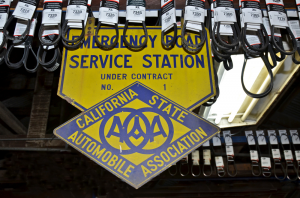 I applied the brakes, deftly executed a U-turn and, voila, I was face to face with said truck, greeting me with a battered grille atop which was affixed a badge reading “Moreland.” Moreland? I fancy myself as being pretty knowledgeable in terms of identifying cars and trucks, but Moreland didn’t ring a bell. I grabbed the camera, slung it around my neck and walked inside the building, where a young man was working on a 1980s Jeep perched above him on a lift. Cupping my hands to my mouth, I yelled, “Hello!” Holding a box-end wrench in a very greasy hand, he walked around to the back of the lift where I was standing. “Something I can help you with?” he inquired. About ten minutes into shooting the Moreland from various angles, he walked over. 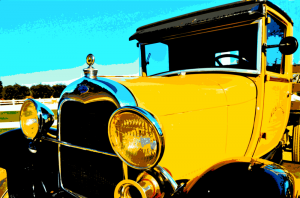 The vehicle in question, I would later have confirmed by Mr. Parady, is a 1930, painted dark blue and nicely fancied up. The interior was completely redone. Shooting was challenging because there wasn’t much room to navigate, and, moreover, the ground was strewn with all manner of junk. As I am shooting from the front, lying on my stomach on the oil-soaked ground, a figure approached. All I could see initially was a shadow. “You been here long?” The Shadow asked. I introduced myself and handed him a business card. “As you can tell, he’s friendly … except for when he’s not. 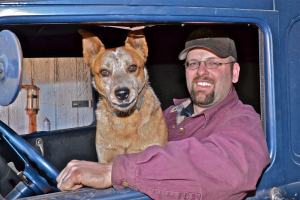 As long as I’m with him, he’s no problem, but believe me, he’s an all-star guard dog.”Yup. You know, ‘Here boy, here boy.’ Sort of silly, but it makes people smile. “When you’re done here, come inside and look around if you want to. 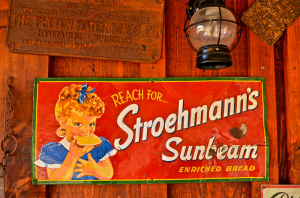 Lots of old stuff that might be of interest to you,” he said, pointing to a yellow-and-blue diamond-shaped sign hanging from an exposed crossbeam. I’ve done a lot of traveling and never before had I seen anything like it. Definitely worth stopping for a picture or two, I convinced myself. Here is one that says it all. Possibly the tackiest tableau I’ve ever witnessed. Mighty glad I don’t live anywhere near it. A mile or so beyond was Aetna Springs Road, where, as instructed, I made a left turn, then headed up the two-lane road. Up yonder was a horse ranch, bathed in lovely afternoon sunlight. One chestnut-colored horse was munching on grass off in the distance. I wanted to shoot him (they shoot horses, don’t they? ), but he too far away. Then I spotted a paddock in which several other horses were, well, padding around. I grabbed the camera, got out of the car and walked over. 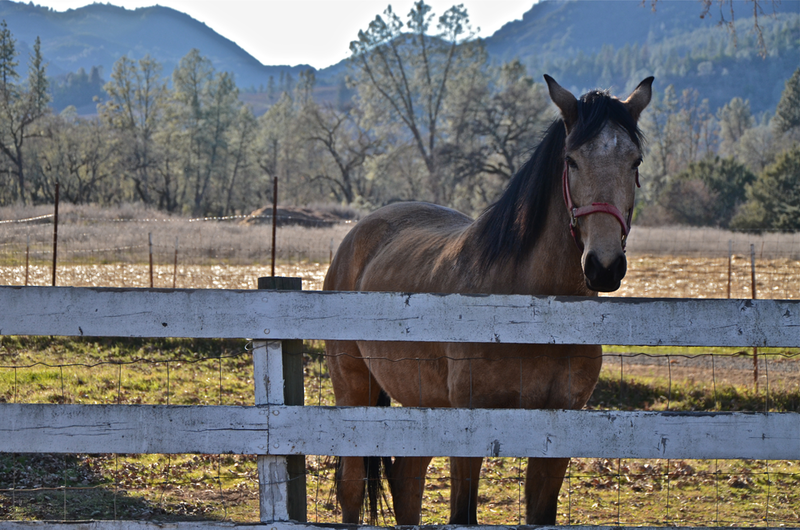 One of the horses took note of me and strolled over, poking his head over the well-weathered wooden fence. He looked at me, straight in the eye, as if to say, “Who the heck are you and who invited you?” Immediately after I took the last of several shots – shown here – he dashed off, whinnying, precluding a signature on the model release form I never remember to take with me. Not far beyond the aforementioned bridge I saw the old Ford to which Jeff referred. I pulled into the driveway, put the car in Park and, not knowing what gear I might need, grabbed the “everything” bag. After taking pictures of the Ford and the Pontiac at the entrance – shown above – I squeezed through the heavy metal gate and looked about. 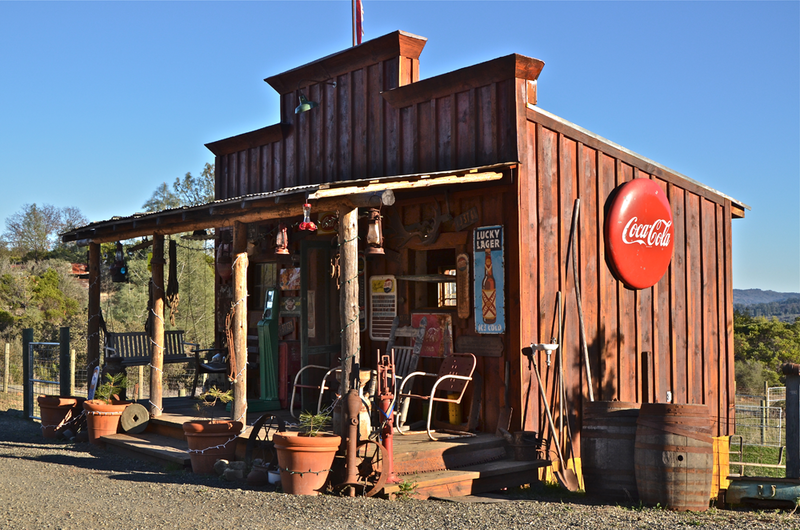 At the bottom of the driveway and around the bend was a most curious sight – an old country General Store that looked as if frozen in amber. 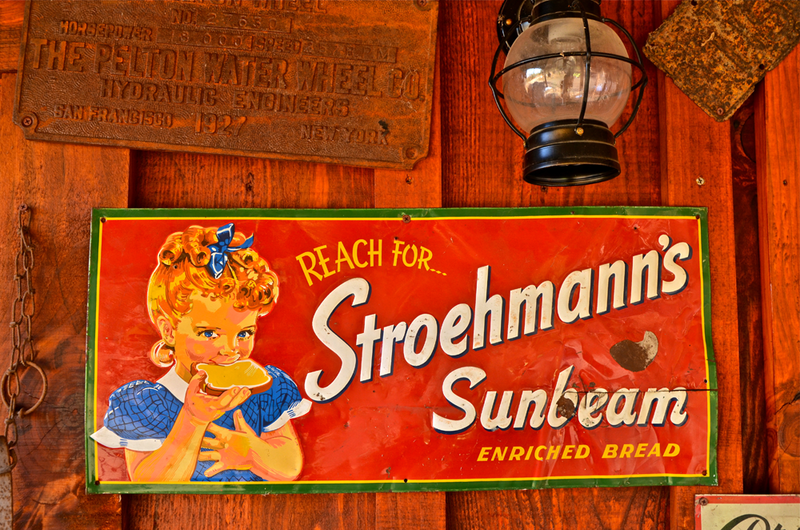 It was painted red and bedecked with all manner of period bric-a-brac, including several uber-cool old signs, this among them. Once done there I continued down the driveway, through an S curve which led me to what looked like the Promised Land for a photographer drawn to Rusted Relics. 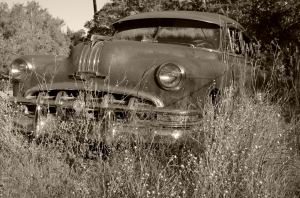 Altogether, I counted a dozen examples of abandoned, deteriorating “vintage” vehicles, or parts thereof. I couldn’t believe my eyes. Had I perchance been magically transported to the Land of Oz? Certainly seemed so. Several Fords, two Chevrolets, two additional aged Pontiacs, one of which was riddled with bullet holes. 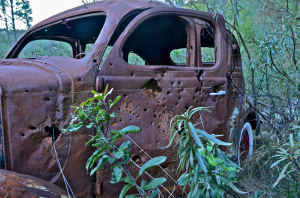 Additionally, several detached front ends were scattered about, one of which was from a 1950s Dodge truck. 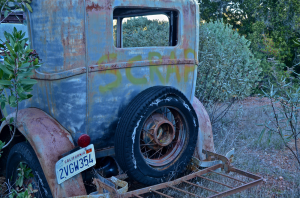 I was drawn to a 1930ish Ford two-door, flat-roof sedan, distinguished by two things, both spray-painted: a “hot rod” bedecking the hood louvers and the word “SCRAP” inscribed on both doors and on the trunk. For me, this represented the piece de resistance. I scrambled about, pecking for other photogenic subjects, but found nothing. Which was good, perhaps, because by now it was nigh unto four o’clock and the sun was soon to bid goodnight. 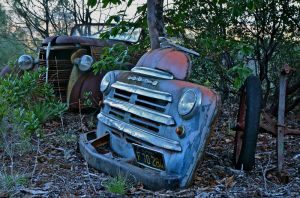 More than satisfied – indeed, elated – with my serendipitous pictorial “harvest” in wine country, I repaired to the car, scrolled quickly through the images recorded, tucked the camera away and put the car in gear. Two hours later I was back home, eager to tell my wife, Pat, about my over-the-top fruitful afternoon, possibly the most productive two-hour block of time to date. How grateful I was that I had stopped to tire-kick the unloved Moreland truck sitting forlornly outside an unprepossessing repair shop.